Yesterday, I wore 2 of my newly purchased items - the Mossimo plaid shirt and the Ann Taylor chunky linear knit tweed jacket. I can't tell you know much I love this flannel shirt. It's cozy, it's soft and it fits me like a glove. The XS is almost too small for me. I have to be careful and not to keep it in the dryer for a long time. I am going back to Target today to get the ebony plaid one before the deal expires. If you're looking for a flannel shirt to layer for winter warmth, I highly recommend this shirt. It is available in 12 different colors so there's certainly something for everyone. Another new item that I purchased this week was the Ann Taylor linear knit tweed jacket. I've seen it in store before but the $228 price tag scares me. Fortunately, it was marked down to $69 plus an additional 40% in store. I ended up paying $41 for this jacket. This jacket fits tiny and I know I won't be able to fit in a 00P. I like it because it's different than anything I have in my closet. Two-tone jacket seems like one of the hottest trends this Fall. Both of the items mentioned here are still available in store if you're interested. This is the best time of the year to catch deeply discounted seasonal clothing at retail or online stores. Hope you are able to take advantage of these promotions and score some great items for you. Very casual, yet very chic as well. Sweet style, Sydney! Looking great. What a great deal Sydney on both items! $10 for the shirt and $42 for the jacket! I like you how paired the tweed and flannel together! Great deals! I like the two tone AT jacket. Very casual paired with the plaid shirt. LOVE LOVE LOVE this style. This is what I wear most of the time, and tees and tanks. It's so casual and down-to-earth. You got such great deals! Love when that happens:) Tweed and flannel is something I wouldn't think would look good together but you look great! 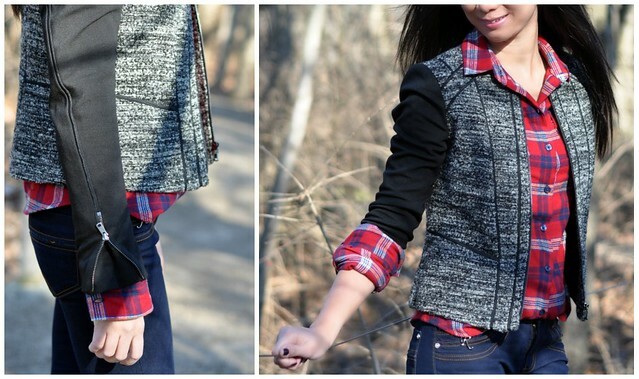 nice shirt, it looks nice on you :) and lovely blog! ohhh I like the Tweed. Has that edgy look with the zippers. The red flannel shirt looks good on you. I just came back from Target but didn't buy any clothes this time. You got such a great deal on that jacket! And I LOVE plaid flannel shirts - they are one of the most comfortable things to wear! Amazing score on that jacket!! That shirt fits you so well! I love those colors on you! I love your boots the fit your calves so nicely, I have such skinny calves that it's so hard to find a nice pair of boots. Wow - what a great deal on the tweed! Love how both the flannel and the jacket fit you so well! Cannot believe you scored that tweed jacket for only $41! Amazing deal, and it fits you great. Great shirt!....made even better by being such an awesome buy - Whoo Hoo! !